I missed this story when it first came out in July, but I think it’s far too interesting not to share! The video above was made by Christina Kobb, a Norwegian pianist who has been studying Viennese piano manuals from around 1820. She noticed that the instructions for the most basic aspects of technique- the posture of the body, arms, and fingers- were very different from those taught today. Based on her research, she re-trained herself to play piano using those historical techniques. What an accomplished lady! This advice is echoed in many of the other educational guides I’ve read from the later 18th and early 19th centuries. For writing as for piano-playing, this posture seems to place focus on the fine actions of the fingers rather than larger movements of the elbow and wrists. 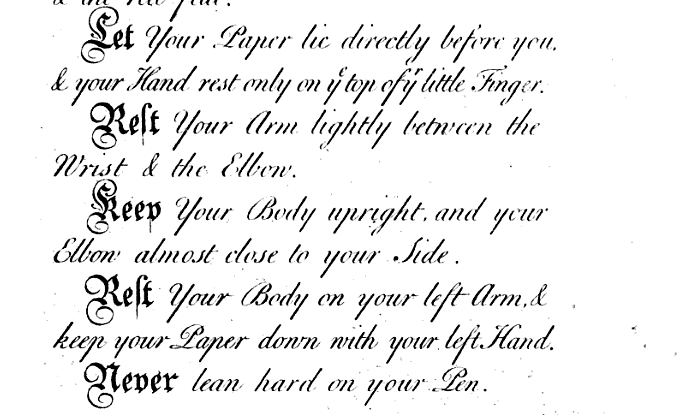 Ergonomic considerations aside, the preoccupation with posture in writing and music manuals is also a reminder of the role these accomplishments played in teaching deportment. The term deportment is usually used now as nearly a synonym for etiquette or manners (at least in the US), but its original meaning has to do with elegant management of the body. In this period, grace, poise, and controlled movements were important signs of a genteel, “well-bred” person. It’s obvious that dancing might show off how graceful and well-trained a person was, but writing, playing the piano, and even needlework were also opportunities for displaying elegant deportment through posture and the movement of the hands. Christina Kobb’s research gained wider exposure this summer due to an excellent New York Times piece about the science of music. Rolf Inge Godoy, a musicologist at Oslo University, filmed Dr. Kobb’s piano-playing using motion-capture technology (the same techniques that allowed Benedict Cumberbatch play Smaug in the recent Hobbit movies). Dr. Godoy will use the data he gained to quantify how historical techniques affect the sound of the music Dr. Kobb plays.